People lie constantly. Especially if you include in your tally the most common lie of all: “I’m fine.” As much of a social lubricant as this lie is, it represents an essential fact. People don’t want to reveal… too much. We learn to lie in childhood. Saying “sorry” when we are not, saying what others want or expect to hear, saying we are okay even if we are scared or sad. These lies are told to please others. Or to help others avoid the discomfort of knowing our truth. If you think about it for half a second you will realize how sad that is. We also lie to protect ourselves from consequences. As children, we might have said “not me” when asked who broke the teapot. What are we afraid of? Being responsible for our own actions? That’s sad too. What we learn in our formative years, about the comfortableness of lying rather than “dealing with” the messiness of truth, we continue to perfect as adults. Lies are most often born of fear. Or sometimes we lie to gain recognition or advantage or because we simply lack problem solving skills. A classic dating lie: putting the wrong age on an online profile. This lie, and others like it (about age, weight, income etc.) is rooted in fears that we won’t be desirable (fear of rejection). It’s also based on the desire to gain the advantage – getting attention on our profile – by seeming more desirable (so we think) than we would if we told the truth. But then what? Maybe you get a string of dates with people who don’t know an essential fact about you: your age. If you move forward with a relationship, you, and the relationship, will be haunted by that original lie. Therein lies the rub. Whatever you think the “messiness of the truth” might be – the outright chaos that follows in the wake of a lie is far worse. Trust me. Although your lies may project an image you want to cultivate, what will you attract into your life? If you are a copy writer and you tell people you are an advertising director, or if you are 42 and you tell people you are 34, or if you make $30,000.00 a year and live in an apartment but casually “mention” your house in the country… what are you cultivating? Meaningful relationships are based on two people knowing one another and connecting. A real connection is based on: “I like you – you, the way you are.” It is a sickening feeling to realize someone is drawn to you based on information that is actually not true. That relationship, by definition, is superficial. And doomed to be short-lived. A habit of prevarication may lead you to draw people to you who match you lie for lie… but how will you really know? Trust is destroyed when lies are told. There is an unspoken agreement that is the foundation of all relationships, from collegial relationships and friendships to romance. That agreement is that we will treat others the way we want to be treated. When we lie, we break that bond. If you have broken that bond, you can come clean, change your behavior, and yes, mend your existing relationships. By coming clean about the lie, and changing your behavior, it is possible to mend a relationship. Telling the truth, no matter how bad the truth may be, is much better than the deception that will eventually rise to the surface. If you find that you are very suspicious of the people you know and sure that they are lying to you, look inward… are you creating an atmosphere of distrust yourself, through your own actions? There are other kinds of lies, however, just as damaging as lying about the facts. When you lie and say, “I’m fine,” when in fact you are grief-stricken, terrified, depressed, or lonely, you hide your true self from others. People do this kind of lying without even thinking, and what is the consequence? The people in your life might know the basic facts, where you work, how old you are, what your hobbies are, but do they really know YOU? Or do they know a different, falsely projected version of yourself? When we lie to others about our thoughts, feelings, likes, dislikes, desires, and dreams, we are being inauthentic. 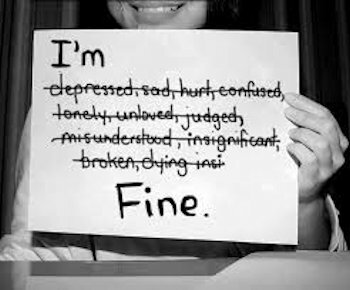 Every “I’m fine” is another brick in the wall that we think will protect us, but only serves to keep other people out. These kinds of lies are often the result of low self-esteem or a sense of self-preservation. And the problem is, we end up believing them. Which means we are lying to ourselves. We stop being in touch with our true feelings and believe the “I’m fine” line. This is by far the most dangerous kind of lying and the worst injustice we can do to ourselves. How can we be honest, appreciated, loved, and happy when we are not living authentically, and haven’t shown others who we really are? You always have a choice of telling the truth and revealing your true nature or lying and hiding it. Are you lying to others or yourself? If you notice that you are unable to have meaningful friendships or long term relationships maybe it’s time to take an honest look within. Are you protecting yourself? From what…? Breaking the lying habit, whether you tell whoppers or simply fail to reveal your truths to those who care about you, is about being completely honest with yourself. It takes courage to figure out what is driving you away from authenticity and into the tangled web. You can heal this self-destructive behavior, and once you start the process, honesty becomes easier and liberating. Self-reflection is a good place to start. Be aware every time you lie. Hear the “I’m fine” when you mean, “I’m having a hard day. Thanks for asking.” Stop yourself when the lie of exaggeration (how many dates you’ve been on since your divorce or when you last got a promotion) threatens to slip out. And stop yourself when you want to simply cover what you think is an “unpleasant reality” with an outright lie. Stop yourself and speak the truth as you know it. Use words that match what your feel in your mind and heart instead. You will feel… so much better.